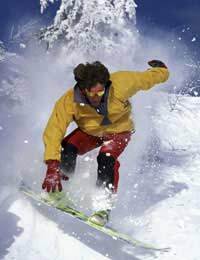 Snowboarding is a relatively easy sport to pick up and it displays a steep learning curve. Most people who take lessons are able to gain basic control of a snowboard within a few hours and with a little more practice and instruction they can perform basic turns. When first learning expect to take a few falls. Unlike skiers, snowboarders do not use poles which make their wrists vulnerable to injuries as these are normally the first point of impact when taking a fall. Because of this, it is advisable for beginners to wear wrist guards when learning. Once basic techniques have been mastered, snowboarders can progress in other ways, for example freestyle tricks, alpine racing, or backcountry hiking. Because snowboarding is fairly quick to learn, there is a great sense of achievement in progressing. Many people who originally learned to ski and then tried snowboarding claim that snowboarding is much more fun. However, in certain conditions, like hard packed snow and ice, skis perform better than snowboards. Snowboarding can have a powerful effect on those who try it. The sensation of gliding over freshly fallen snow with a group of good friends amongst stunning alpine scenery is often so exhilarating that many people say they become addicted to the sport. Snowboarding is inherently fun and there are very few people who, after correct instruction, can say that they didn't enjoy their experience. Such is the allure of snowboarding, that many people devote their lives to doing it as much as possible, at the cost of long term relationships, stable jobs and money as they chase the winter around the world. For others, snowboarding is an obsession lived out on annual holidays and on the dry slope and snow dome circuit. Snowboarding, compared to skiing is a young sport. As it has not been around for as long as other sports, the average age of those who do it is much lower. Because of this, it is highly susceptible to the fashion changes, and some slopes resemble more of a fashion parade rather than a winter sport. Indeed, some people have been accused of learning to snowboard simply because it is currently considered a "cool" sport. However, as more and more companies have used snowboarding in their marketing campaigns, the once "extreme" image of the sport has been some what diluted. As snowboarding has grown, distinct factions have appeared within the sport. For example, many riders, especially younger snowboarders are very keen on learning freestyle tricks on kickers, rails and in the half pipe. Recent snowboarding legends like Shaun White have severed to boost freestyle snowboarding into the media spot light, and many snowboarders are inspired by these high flying pros and seek to emulate their amazing tricks. Sometimes referred to as the "tree huggers" of snowboarding, backcountry snowboarders are often more in tune with nature than other snowboarders and tend to have a better understanding of the mountains due to the knowledge they have gained from spending a lot of time hiking and riding outside of controlled areas. Snowboarders are becoming increasing more well travelled as they head to new and exotic destinations to ride the mountains. Snowboarding can be seen as a vehicle in which to explore new countries and see new cultures, as many snowboarders will travel to places that they wouldn't have done if it hadn't been for snowboarding. So, what can you expect from snowboarding? Answer: a lot of fun.